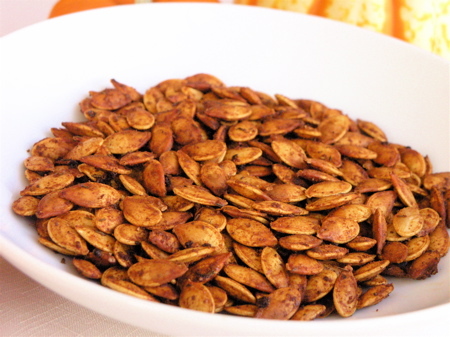 If you’re using seeds from your jack-o’-lantern, wash thoroughly. Place seeds in a large pan with a heavy bottom over medium heat. Stir often for about 5 minutes, until the seeds begin to crackle. Remove seeds from heat and stir in olive oil and seasonings. Nutritional information, per 1 ounce serving: 148 calories, 11.9g fat, 9.3g protein, 3.8g carbohydrate, 1.1g dietary fiber, 0mg cholesterol, 103mg sodium, 229mg potassium, 12.2mg calcium.